How time flies! And offlate it seems to be flying faster. Taking stock of the year past and making plans for the current year the Sindhishaan team is pretty satisfied with what was achieved in 2002. 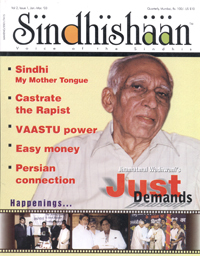 § 4 Issues of Sindhishaan – Voice of the Sindhis. § 9 Issues of Prerna – Be inspired. § Dramatic increase in registration and visits to Sindhishaan – the Virtual State. But the greatest satisfaction is derived from the love, affection and encouragement showered by the community from all over. The strong bonds and invaluable relationships developed with so many towering personalities amongst the Sindhi community are ample rewards for the efforts, time and money ploughed into the endeavour of ensuring the Revival, Survival and Flourishing of SINDHIAT. If Sindhishaan has to name the one single individual who has been a beacon on this dark and difficult path of preserving Sindhiat, who like a knight in shining armour has been setting a scorching pace that others, half his age find difficult to cope with, working ceaselessly with tireless efforts and a totally focussed mind – the name that springs up is none other than that of Shri Jhamatmal T. Wadhwani – a friend, philosopher and guide to Sindhishaan. Tall, erect, with a ramrod posture Shri Jhamatmal T. Wadhwani is the “Rock of Gibraltar” of the Sindhi Community. The stern expression, necessary for an educationist, conceals a tender heart. A man, who at the age of 82 is willing to climb any mountain, face any adversary, fight any foe and answer the midnight knock – for the cause of Sindhiat. It would be repetition to the content of articles in this issue to say any more but truly the energy, the drive Shri Jhamatmal T. Wadhwani possesses is indeed amazing. He has been and shall forever remain our cherished mentor. AND THE STEELY DETERMINATION TO SUCCEED.